Prior to the days of water trampolines, backyard heroes and pool enthusiasts alike had more ambition than options when it came to using the pool and the trampoline together. 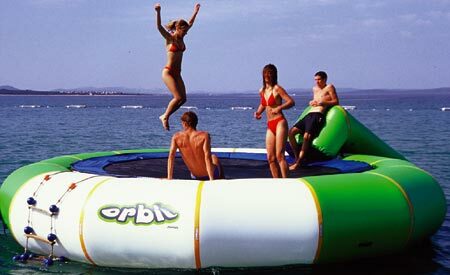 Most thrill-seekers had to have a roof, a trampoline, and a pool in order to accomplish some of the fun that water trampolines are now capable of providing. Nothing was more fun than jumping off my buddy’s low hanging roof onto his trampoline, the momentum created allowing me to effortlessly clear the fence separating the pool area from the rest of the backyard and land in the twelve foot region of his in ground water oasis. Looking back on it, I cringe at the disastrous impact a misplaced foot or the slightest of slips could have caused, however, I also marvel at the way we were able to combine so many bad ideas into one. Over time, everything evolves. Some ideas are refined and polished, some ideas are put on the shelf, and some ideas will always be just a bad idea. I’m not entirely sure which category the evolution of trampoline into water trampoline falls under, but it was definitely not shelved. 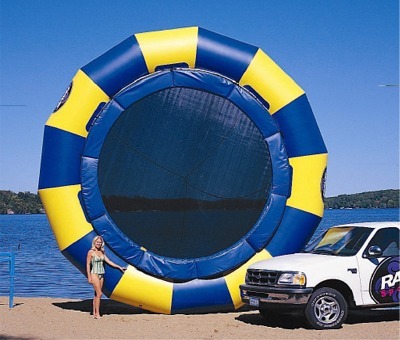 If you are still following my obvious logic, you have figured out that the trampoline has evolved into a floating bouncy raft, too big for pools but the just the right size for your favorite body of water, from lakes to oceans and anything in between. The danger is still there, but for those of us who consider activities like these fun, the more appropriate term is “thrill”. The new environments made possible by the water trampoline still have the risks for whiplash, concussions, and broken bones, but now you have the added excitement of predatory wildlife, and I’m not talking about your creepy cousins who show up every August once the mercury hits 90.